Getting derailed by this little experiment at the moment. 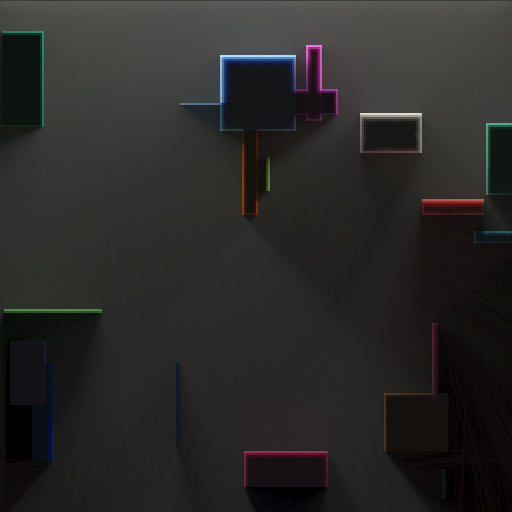 I posted some 2D global illumination thing in "Beautiful fails" of a light rendering thing I was working on. It's really basic. Just simulates photons as balls that bounce around and get multiplied by the color of whatever they hit. Original version was in processing and was quite slow (took about 1 minute to render a 256 x 256 image with good quality), and here's a faster one I wrote in C# which takes about 1-10 seconds for the same kind of render. 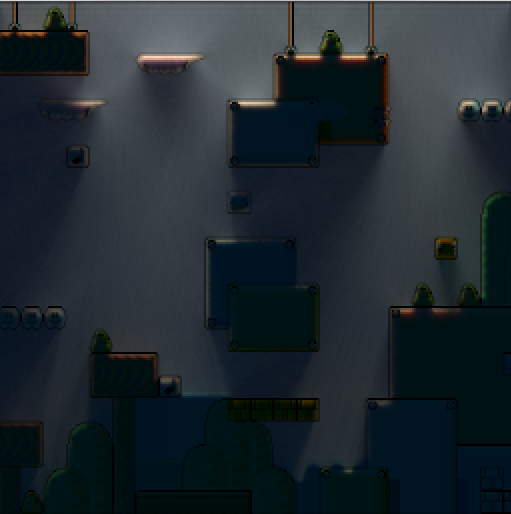 I also added high dynamic range + tone mapping to make things look a bit better. Could probably make it real-time if it were written on the GPU. 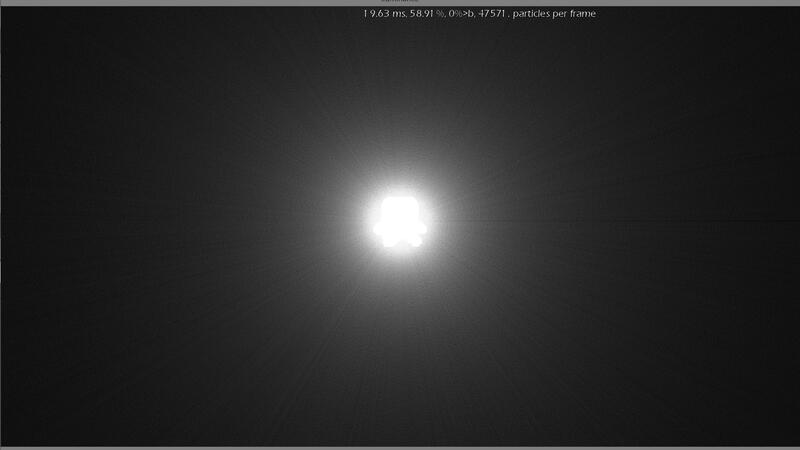 Just had to lower the quality a bit and decrease the exposure time, plus split the photon calculations into 8 threads. 4. Each light has N threads, each assigned to segment of the photon buffer. The threads just update each of their photons. A photon adds its own color to the light buffer. If they hit an obstacle in the occupany grid, they get a random velocity and their own color is multiplied by the texture of the obstacle. If they leave the screen, they are set to dead. If a thread sees that a photon is dead, it will re-create it with the light's emission rule. 5. The scene has a thread which is constantly doing post-processing on the light buffer. It determines the color of a pixel by multiplying the light buffer with the texture underneath. Then it does a global scaling operation and applies a gamma curve to keep everything in the range [0, 1]. 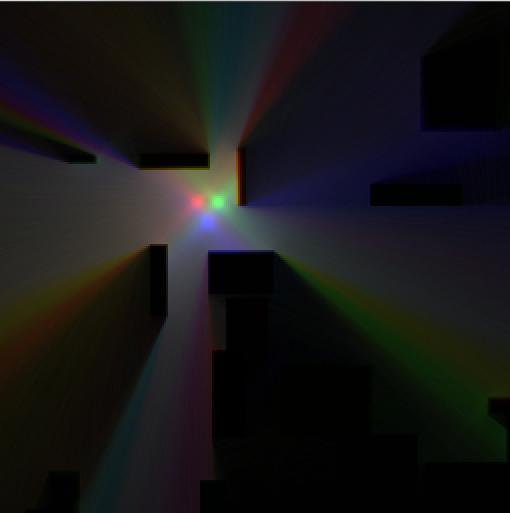 This thread also "decays" the light buffer slightly (by multiplying it with a constant < 1. If the mouse is moving, the constant is lower, and if not moving the constant approaches 1). 6. The graphics card just dumbly reads the color buffer that's being modified by the post-processing thread. Each of these steps is trivially made parallel, and I could imagine this would be 10,000x faster if I could figure out how to implement it on a GPU. Looks really cool! Though you can see some of the photon trails in shadow areas. What about reflective surfaces which bounce the "photons" in a focused direction? Or refractive surfaces that bend the ray! Or things that have to be activated by creating a color with RGB lights! Needs to be realtime though! This looks astonishing! The single-colour lights break it, though... at that picture I wondered if you got gamma correction, but I assume you're already doing this when you're employing HDR and tone mapping. I was pondering if that could be done on the GPU, for example by sampling mip map cascades. I haven't found a way to get this sharp silhouettes, though - mip mapping would spread the colours equally in all directions while you'd want to bounce them strictly along the wall normal. Interesting topic. That looks super pretty! 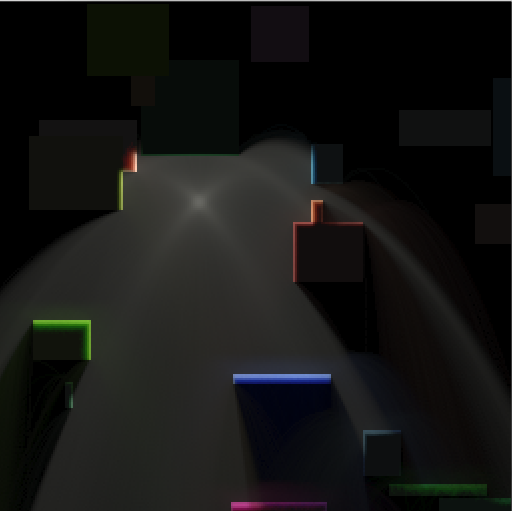 Even if it runs really slow, you could use it on when a level loads up as some kind of baked lighting in a game. I set up 8 threads, each one double-buffered, that simulate particles one by one accumulating the results in their private backbuffer. The main thread then round-robins at 60 fps between them, stopping a different one each frame, swapping their back/front buffers, and uploading the new front buffer to a texture. Then, the texture of each thread is added and averaged using 8 alpha-blended quads layered one on top of the other. I think the GPU version might be possible using just a custom vertex shader (where each vertex is a photon), they then write into a buffer somewhere on the GPU. The pixel shader then does the color correction + tone mapping on the buffer in a second draw call which just draws a fullscreen quad. Not sure how efficient writing texture memory would be though. Definitely would be efficient in a CUDA-like environment. lights have a strange "clover" shape, and if a thread is "early" on the swap it will write twice over part of its assigned rays because it starts again. But screenshots will come, eventually. Looking forward to any screenshots you post! Then it does a global scaling operation and applies a gamma curve to keep everything in the range [0, 1]. 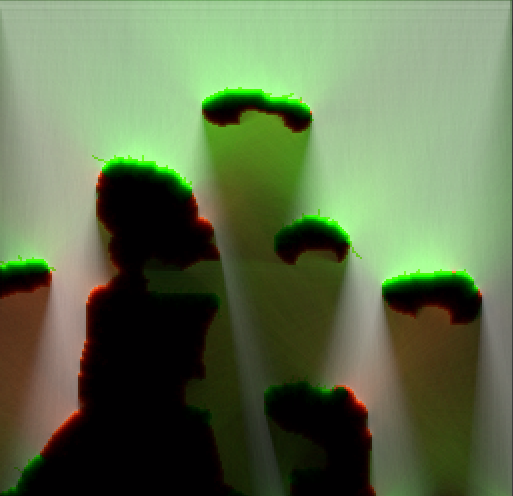 This thread also "decays" the light buffer slightly (by multiplying it with a constant < 1. If the mouse is moving, the constant is lower, and if not moving the constant approaches 1). Sounds like this could be a major bottleneck. _Madk, what would? If I correctly understand what he meant, applying the gamma curve is both pretty trivial and fast, also decaying is just a ping-pong render - nothing a semi-decent GPU can't handle. Oh, you don't need to bring CUDA into this to make it fun and fast! Rendering your particles as alpha blended lines into a texture with FBOs will be pretty much as fast as accumulating the light can get. The biggest problem would probably be finding intersections with the scene - you could go with distance fields, some octree solution or just move your light particles slowly enough so you don't run into problems with too much texture sampling. With a more elegant ray intersection system you could possibly remove the particle thing altogether and replace it with some form of path tracing, possibly with a system to detect and reduce noise and reuse old results when there are no big changes in lighting. Just rendering with particles larger than pixel size would probably be sufficient, as you can render a great lot of them nowadays. I might give this a try later on, it seems a lot more solvable with current hardware than the 3D alternative I've been thinking about too much lately. I would imagine it involves looping through each pixel (to find the brightest one) and that sort of thing can be demanding. Also, isn't it being done on the CPU as it currently stands? 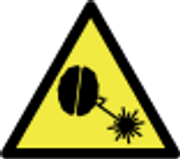 a particle involves colliding with a bitmap while rasterizing a line (eg. with bresenham) and that requires a lot of nonlocal read/writes which can really clog the GPU. But probably being able to write directly to the VRAM texture offsets any advantage the CPU would have, so it would probably end up faster even on bad GPUs. Another problem would be that with a really big number of threads, the chance that two or more threads are writing to the same pixel increases, so += operations (read, increment, write) are going to be wrong all over the place (say, read1, read2, increment1, increment2, write1, write2 or worse)... so you need to choose to accept the noise or use atomic_incr operations which are slow as hell and would probably make everything slower than the CPU. On the CPU this isn't a problem because with a reasonable n of threads, you can just allocate a backbuffer for each thread. Screwed around with the GPU for a bit and indeed it seems like it will be a much bigger challenge than I anticipated. 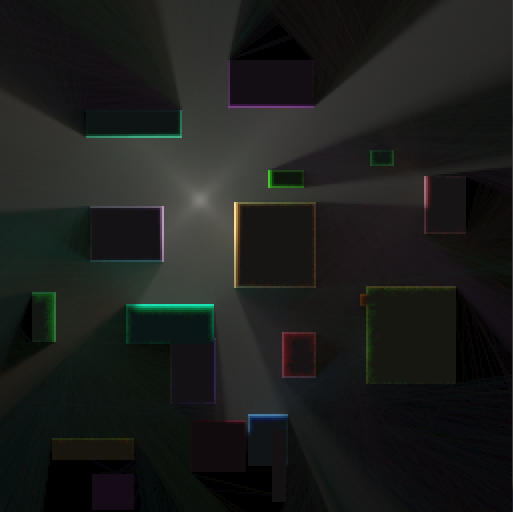 Forward simulating lights and then accumulating them into a buffer is trivial, but the collisions make everything difficult. I think the best I could do is perhaps texture sample the collision buffer and then every frame render out to a "hascollided" texture (that's N x 1 pixels, black and white). Then the CPU would every now and then check the buffer, and reset the photon whenever its collided to the appropriate color + position + velocity, and send it back to the GPU. Probably really inefficient both because of the random reads and the constant sending of new data to the GPU. So I think if I continue with this I will focus first on doing the post-processing (HDR) in the GPU, and then second on the light accumulation (as someone said earlier, I can just render line or large boxes). With those bits taken care of by the GPU the CPU will be freed up to do more physics calculations. Btw, doing some profiling on my original code reveals 76% of the CPU time is spent in the light physics threads. In those threads I spend about 42% of my time in each light thread just accumulating the light buffer, and about 20% of my time total aside from the light physics threads is spent doing the HDR calculations. phew, turns out that Bresenham is terrible for this thing (caused the cloverleaf), so I had to switch back to the plain old float position being incremented (slower but actually spherical). The backbuffers are unsigned short*s now; this removes the need for an overflow check (faster) but increases bandwidth use (slower)... overall it's worth it, with a net +10k particles per frame. And it allows for a crude HDR too, it's quite needed. running at 60 fps would be possible, but I would need to offload the blur/tonemapping on a shader... right now, the main thread does this stuff and it runs in 20 ms.